Horses who have access to plenty of pasture and aren’t working may not need any supplements, but that’s not always the case. Typically horses need additional food, such as sweet feed, to provide extra calories and other nutrients so that they can remain in good health. Many horses will eat everything you put in front of them, so it’s up to you to figure out how much sweet feed your horse really needs. Sweet feed is a mix of corn, oats and other grains; molasses is added to it, generally about 10 percent by weight. Adding molasses minimizes the dust from the fines, or tiny bits of grain, while also adding sugar for energy. A typical sweet feed label not only lists the specific grains included in the mix, it also includes nutrition information such as the levels of protein and fiber. Added vitamins and minerals also may be listed, but the amount of calories in the feed usually will not. From this you must decide if it has what your horse needs. First use a weight tape to measure your horse; the markings on the tape will let you know how much your horse weighs. Then determine his overall condition. While this can be a complicated process, in general if his ribs are prominent he is most likely underweight, while if you can’t even find his ribs he’s overweight. Next decide what group your horse falls into: mature, young or working. Each of these categories can be broken down further into basic maintenance, pregnant or lactating mares, growing foals, horses who work just a little and those who work a lot. The first place to look when determining exactly how much sweet feed to give your horse is at the label on the feed sack. The contents can vary greatly from one manufacturer to the next, and the amount of one brand of sweet feed your horse needs may not be the same for a different brand. Usually you will feed your horse a daily ration of sweet feed that’s equal to a percentage of his body weight, typically between 0.5 and 3.0 percent. Weight it carefully so you know how much you’re feeding, since guessing can lead to over- or underfeeding your horse. Not all horses need sweet feed. For example, horses who are overweight shouldn’t have any, according to the experts at the Rutgers Equine Nutrition Center. Nutritionists at Colorado State University warn that sweet feeds may contribute to various equine health issues, including laminitis, insulin resistance and colic, along with gastric ulcers, Cushing’s disease and equine metabolic syndrome. Some owners report that their horses seem overactive after consuming sweet feed and can be hard to handle. Substituting feeds without the added sugar content may help to minimize or avoid these problems while still providing horses with the nutrients they require. 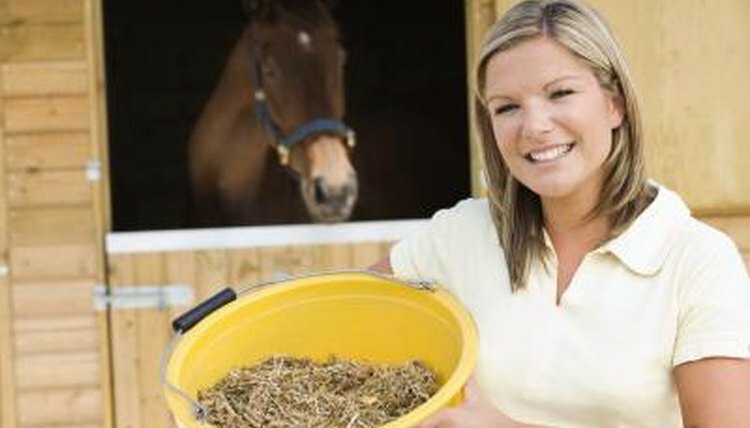 Equisearch: How Much Should You Feed Your Horse?